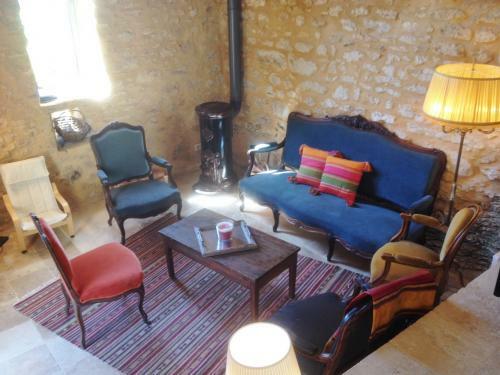 This former small manor house, nestled in a 15th century hamlet, is the epitomy of the beautiful perigordine house: solidly built in the local, golden stone, with its neighbouring barn, remains of the original lauze stone roof, magnificent stone fireplace, and exposed beams and stone walls. This recent restoration successfully mixes modern comfort with the charm of yesteryear. A particular attention has been paid to the decoration of each room, creating a warm and refined ambiance. 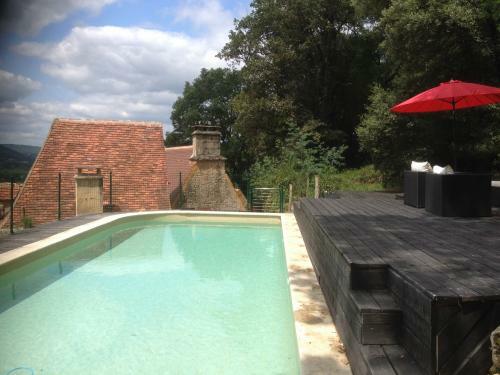 The beautiful, private pool overlooks the property and is reserved for your sole use. You will never tire of the superb, panoramic view, whilst you relax on your return from the numerous day trips available in the local area. 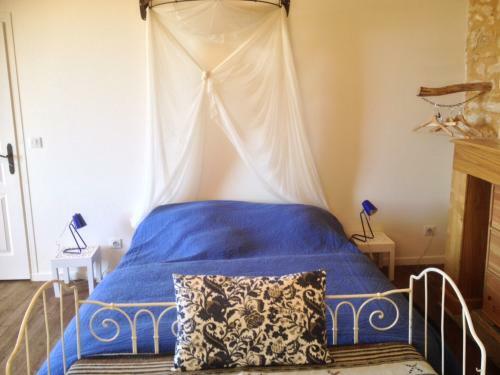 Le Roc offers a surface living accomodation of approximately 150m². * At the front of the house, a few steps lead to the main entrance and the beautiful kitchen, a spacious and bright heart of the house. Its history is in evidence with its ancient fireplace. 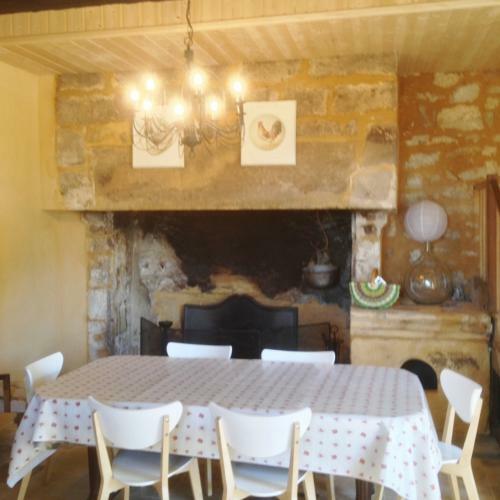 It is equipped with a dining table and 6 chairs for interior meals. 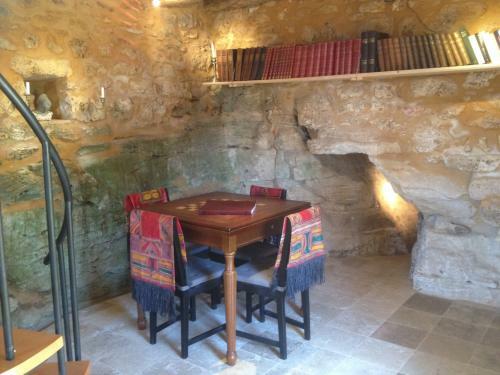 * Carved out of the rock itself, the lounge/dining room is particularly elegant and has high ceilings. 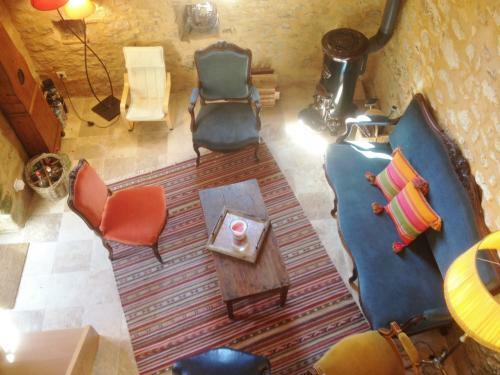 The sofa and armchairs are set around a wood burning stove, which you can light on cooler evenings. The glass door opens also onto the entrance terrace, offering easy access to the outside, ideal in summer months. * The spiral staircase leads up to the mezzanine level where there is a childs desk. From this mezzanine, a glass door leads out to the rear of the house, and allows access to a bedroom via the exterior, and also the terrace and pool area. 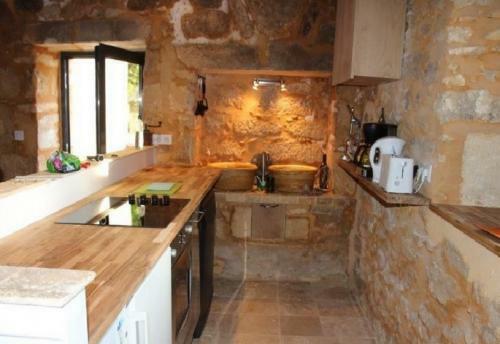 * At the other side of the kitchen, a few steps lead to the huge double bedroom. 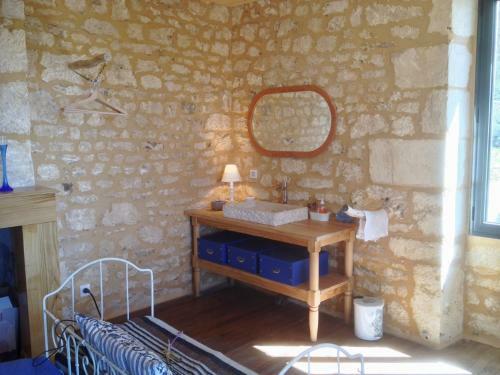 It is furnished with a large double bed (160cm), a chest of drawers, and an open plan bathroom with ancient bath and wash basin. 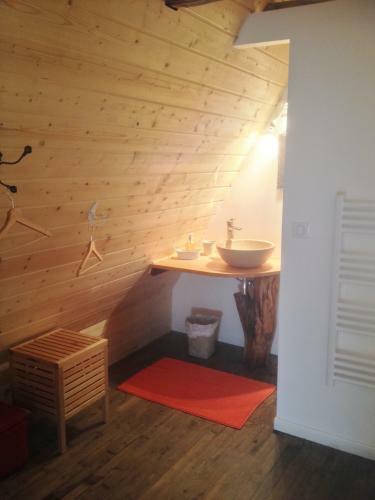 A separate toilet is accessible from this bedroom. * a second separate toilet completes this floor. 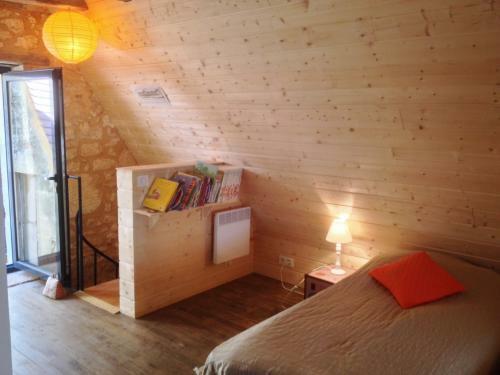 * the orange bedroom, nestled under the eaves offers a large floor space and exposed beams. 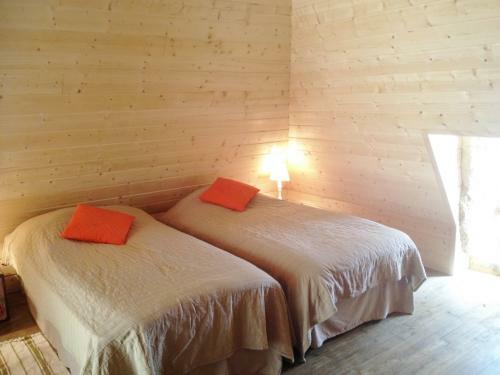 It has two single beds which can be joined together to form a large double bed, and chest of drawers. 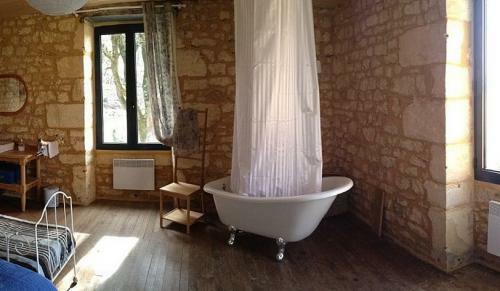 Its private shower room offers a washbasin and a tiled shower. There is a separate toilet. * Gardens, and terraces to all sides, above and below the house, offering a lawned area below, and and different shady areas under the trees. 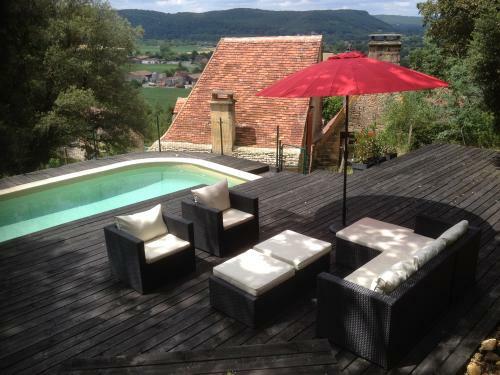 * A shady terrace under the oak trees, equipped with a teak table and 6 chairs, and a barbecue for al fresco meals. 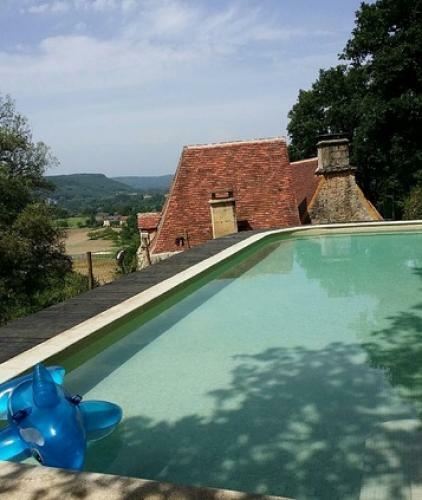 * Large swimming pool, above the house with garden furniture, sun loungers and parasols... and a super panoramic view over the valley below and the chateau of Beynac! * A public footpath passes just below the house - ideal for exploring the local area on foot! 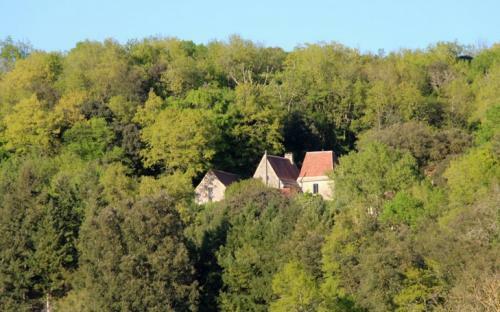 The Maison du Roc is situated in the heart of the Black Perigord, just 10kms from the famous medieval town of Sarlat, classed as a Unesco World Heritage Site. 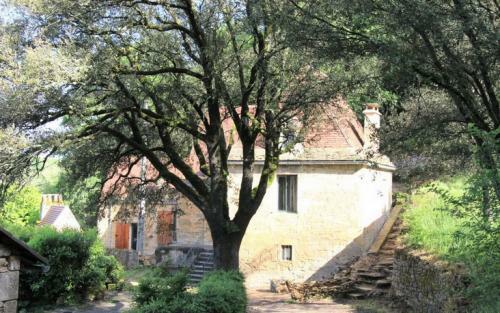 The beautiful villages of Beynac, La Roque Gageac, Domme.... are all within a few minutes drive. It is the ideal starting point for exploring the region. - heating in low season.